Former Sunderland and Manchester City striker Stephen Elliott has moved to Hearts on a two year deal. 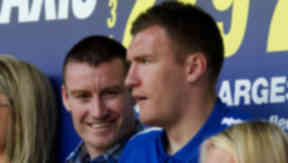 Hearts have completed the signing of striker Stephen Elliott. The Republic of Ireland international has moved to Tynecastle on a two-year contract, after negotiating his release from Preston North End. Elliott, who has nine caps for his country, moves north after a frustrating season at Deepdale, during which he made just 13 appearances and also found himself sent out on loan to Norwich City. After years of crying out for a striker who can score goals, after managing just 35 in 38 league games between the entire team last season, Elliott arrives with promising credentials. Despite finding himself frozen out often during his short career, the 26-year-old can count Manchester City, Wolves and Sunderland amongst his former clubs. Having made two appearances as a youngster at City, he made his name at the Stadium of Light, scoring 27 times in 85 appearances. Elliott then went on to score just five in 32 for Wolves, before Preston snapped him up in 2008. He made a promising start to life in the Championship but, after falling out of favour, is now preparing for life in the SPL, a prospect which excites his new manager, Jim Jefferies. “Stephen's a player I have known about for a while and is someone who has proven himself to be a goalscorer wherever he has played," Jefferies told Hearts’ official website. “He has an excellent pedigree and has played at the highest level with the Republic of Ireland. Despite injury to his other summer striking arrival, Kevin Kyle, Jefferies has spoken of the possibility of the pair linking up in this weekend’s SPL opener against St Johnstone. As the Hearts boss revealed, it wouldn’t be the first time the duo have partnered each other in attack. “He has partnered Kevin Kyle up front before in his Sunderland days so I'm looking forward to seeing the pair link up again,” Jefferies revealed. “The boys know each other extremely well from their time at Sunderland where they formed a formidable partnership.